What to send your student a care package? Please click here! Please visit the Post Office Webpage for more information regarding mail services. Sprint, AT&T, and T-Mobile provide the best cell coverage to campus. Campus Housing is proud to be able to provide on-campus residents with Xfinity HDTV service on Campus both streaming and coaxial service. TV sets are able to be plugged directly into the wall and then be sure to perform an auto channel scan (from the setup menu of your TV) You should use the remote that came with your TV. There is no need for an individual cable box in your room. Further information on how on auto channel scanning can be found on the FCC web site. For more information about cable visit the SMC IT Service Knowledge Base. More channels are available by streaming online than the coaxial cable, you will also can purchase some premium channel packages as well. New this year Campus Housing and XFinity has added for free HBO on streaming devices, and later we will be adding it to the coaxial channel lineup. For XFinity On Campus Streaming Log into https://xfinityoncampus.com/ with your SMC Email ID and single sign-on password. You can download the XFinity Stream App to watch from most devices as well. All residents may apply for a residential parking permit from Public Safety. Saint Mary's College has developed partnerships with the following local services to provide various amenities to our students. From laundry services and appliance rentals, to shipping and storage, students can explore these offers to make moving in and moving out a breeze! 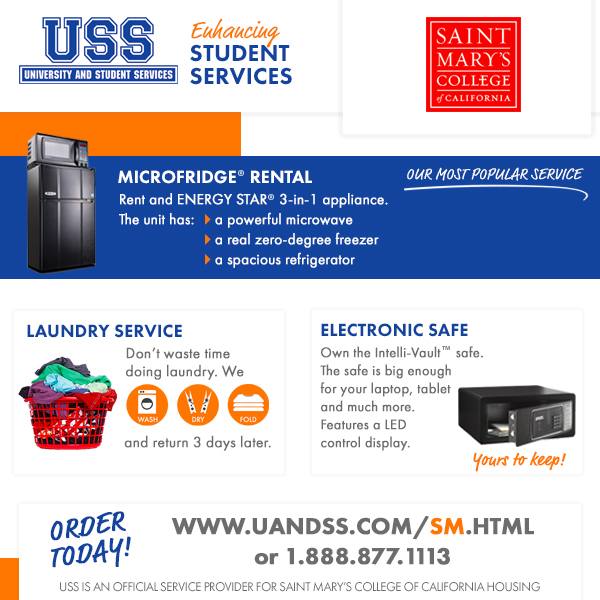 We’ve partnered with University and Student Service (USS) for lots of student services to enhance your living experience. MicroFridge® Rental: Have a fridge, freezer and microwave right in your room. Rent the unit which includes free delivery and pick-up at the end of the year! Laundry Service: Don’t waste your time doing laundry, just throw it all in a bag! We will wash, dry, fold, and return 3 days later. Safe Purchase: Get a heavy-duty safe to store all your valuables. The safe has an electronic display and can fit your laptop. For more information and to order any of these services, visit www.uandss.com/sm.html or call USS at 888-877-1113. 50% off of a 3-month rental unit for SMC students with valid ID. Lafayette Pack and Ship store is a shipping company that will collect items for free, pack them, and call when everything is ready to send. They offer FREE pick up plus FREE packing boxes from St Mary’s College, and will professionally wrap and ship to anywhere in the United States or the rest of the world. Contact Ian or Sue at 925-284-7444 or visit their website at http://www.lafayettepackandship.com/. Please call 1-866-667-5573 or visit http://www.pods.com for more information and to arrange a POD to be delivered on move-out day. Mentioning the promo code EDUCATION will activate a discount and the special flat rate pricing advertised above. More container size options may be available. The POD, once filled, cannot remain on campus and must be stored at the PODS facility over the summer.